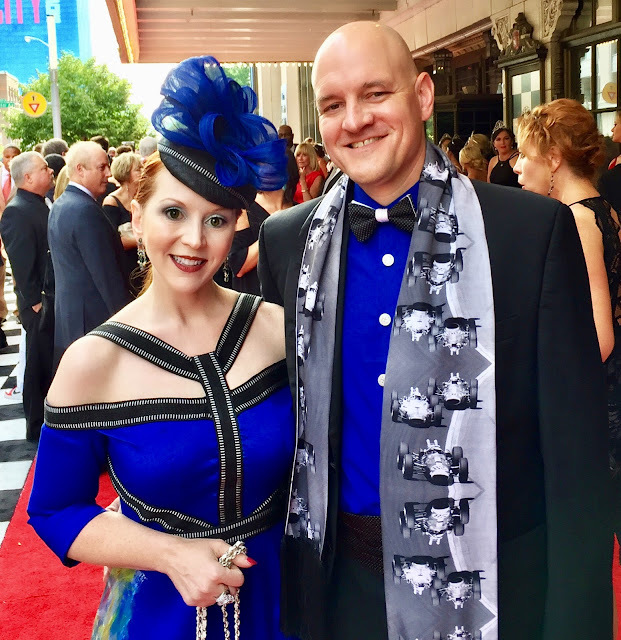 Every year, on the eve of the Greatest Spectacle in Racing, the 500 Festival Foundation hosts The Snakepit Ball, a black tie event to celebrate the Indianapolis 500 and entertain dipolomats and celebrities in town for the race. 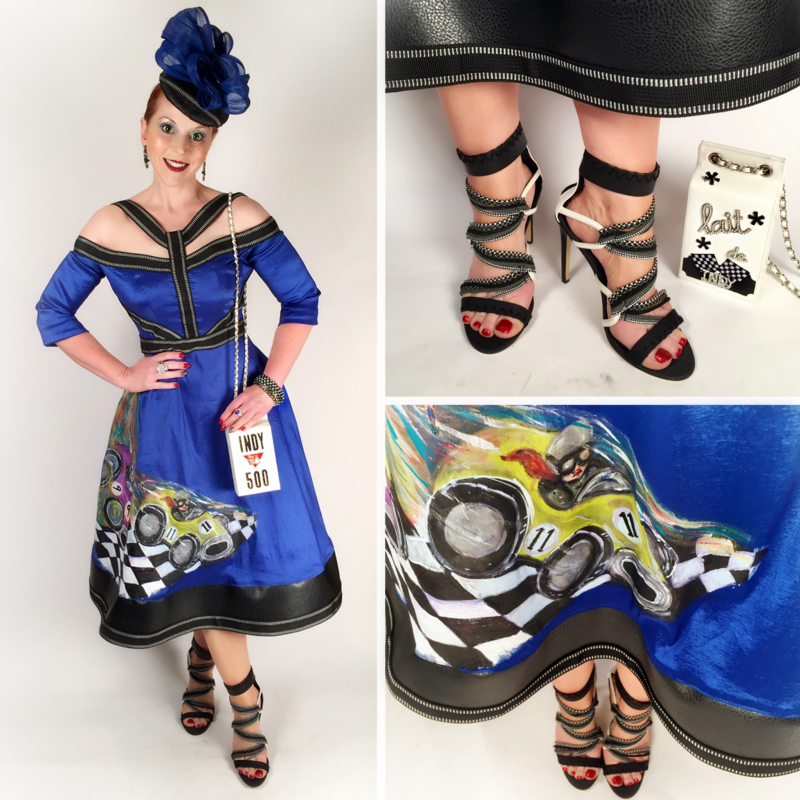 The Snakepit Ball has a different theme each year, though always with some connection to the world famous 500 mile race it fetes. 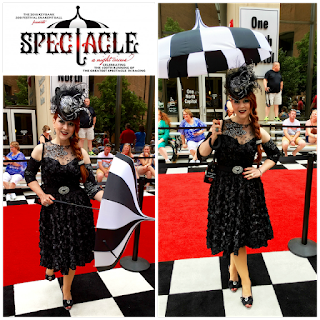 The expected attire is typically black and white, evoking the iconic checkered victory flag. 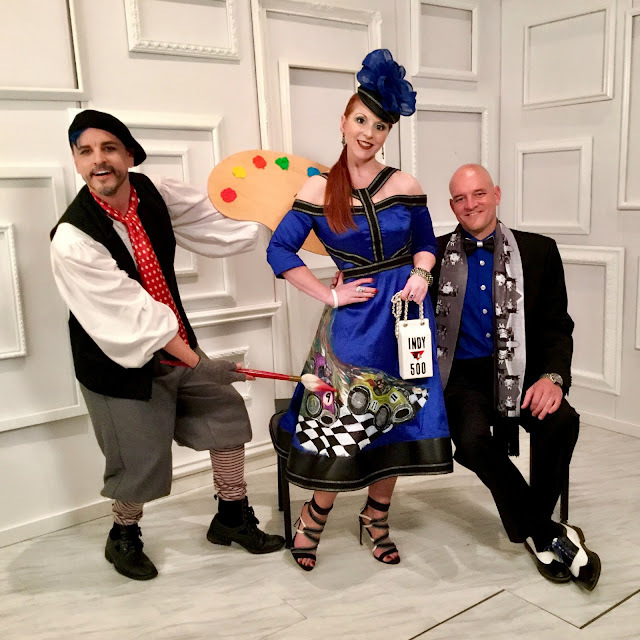 The 2017 Snakepit Ball theme was The Art of the Race: An Interactive Art Event. The Indiana Roof Ballroom was transformed for the evening into a fully interactive combination of Racing and Art. 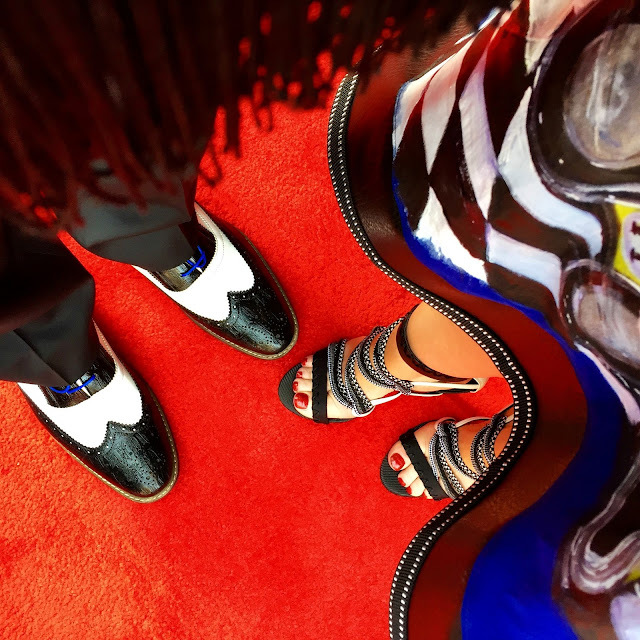 In keeping with the artistic theme, the invitation encouraged guests "to make an artistic statement" with their black tie attire. If you follow this blog even a little, you probably already know how much I love a theme, and one with true artistic license to embrace creativity had my engine revving. 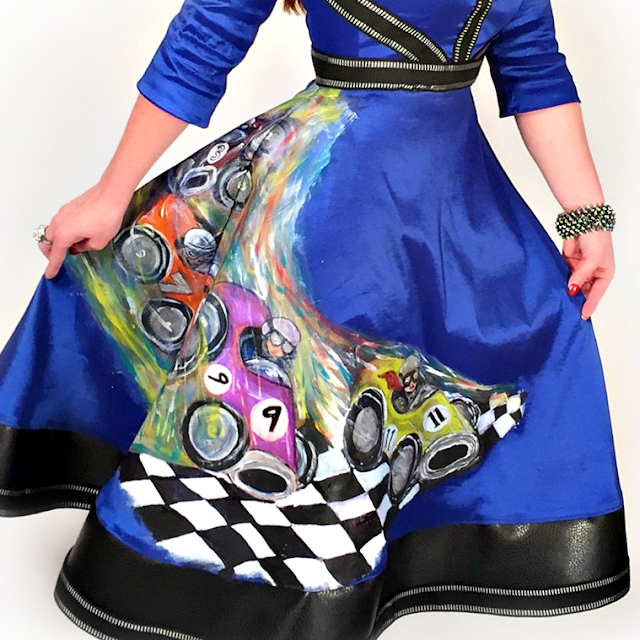 I knew right away that I wanted to embrace color, eschewing the standard black and white fare and celebrating the bold colors I associate with Indy cars and the drivers' graphic uniforms. 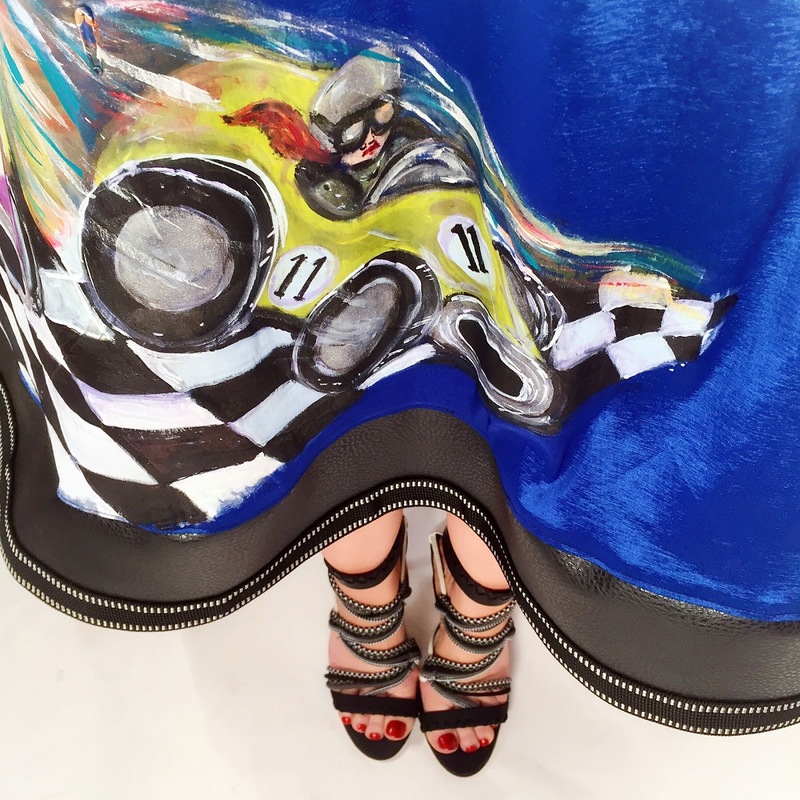 I also knew that I wanted my dress to feature a hand-painted race design. As is often the case, however, my artistic vision exceeded my skill set. So I set about assembling a creative and talented "pit crew" to help me bring it to life. My first call was to my friend Nikki Blaine (featured in the third photo, above). 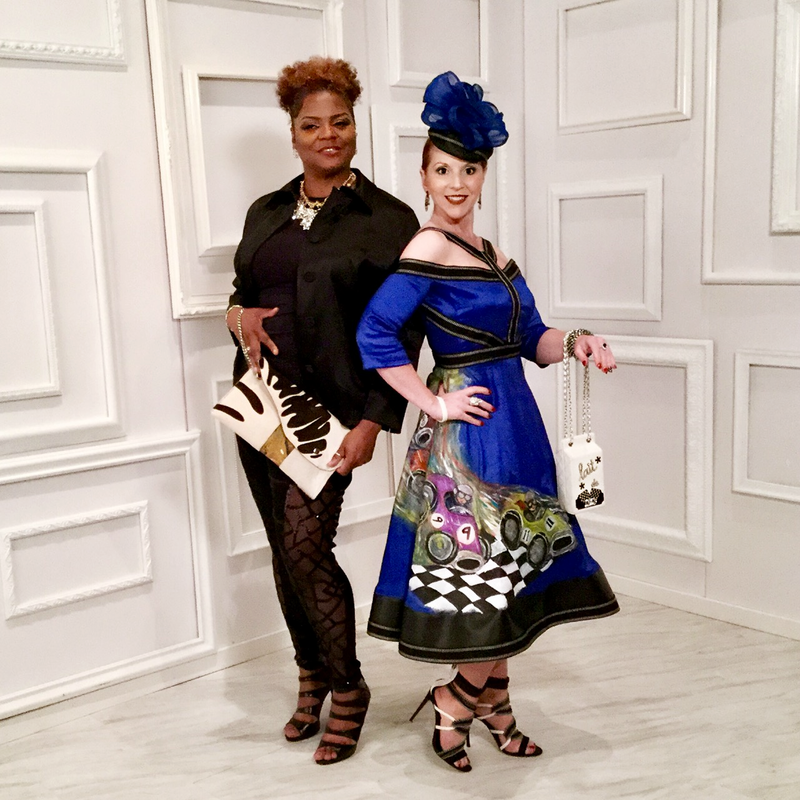 Nikki is the creative mastermind behind Indianapolis-based Nikki Blaine Couture. 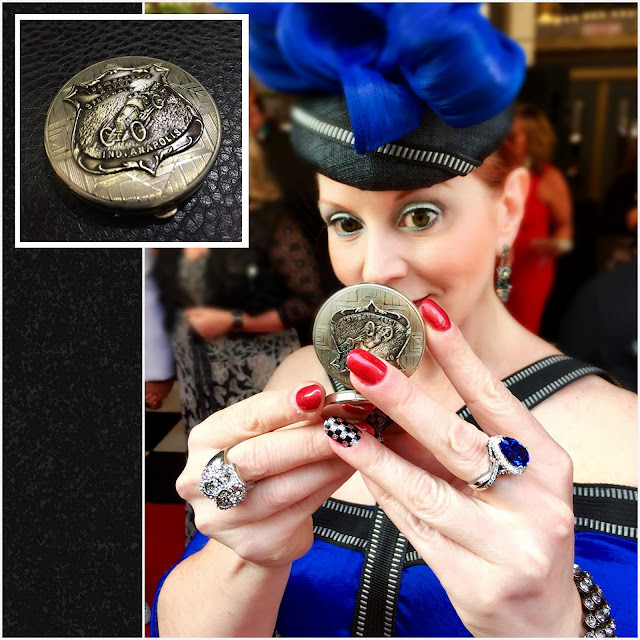 She specializes in custom, one-of-a-kind designs, and shares my dramatic aesthetic. We also laugh a lot, which makes the "business" of working with her a party in its own right! NIkki "got" my vision right away, and together we identified unusual fabric choices (like the webbing and faux leather that trim the dress) and graphic details that evoke race and automotive elements while still embodying evening gown elegance. Nikki also brought local artist Gary Gee on board to round out our (art of the) race team. I had a very specific picture in my head for the hand painted, vintage cars that circle the bottom of the dress, so I was a little nervous about working with someone whose work I didn't know well. But, my trust in Nikki as my "chief mechanic" was well-placed. Gary's work exceeded my every expectation, and he surprised us both by giving the winning driver a red ponytail and red lips! 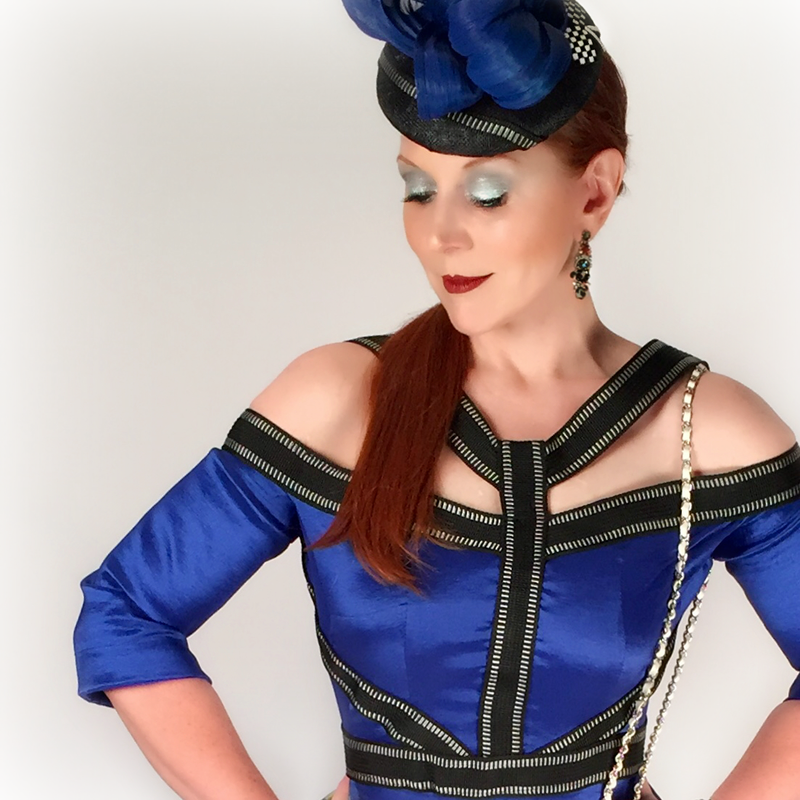 Gary's fine work and the "art of the the race" theme are complemented by every detail of the ensemble: "tire tread" inspired canvas webbing creates the neckline and finishes the bottom of the dress; the same trim also embellishes the cocktail hat and its undulating blue silk abaca fabric, which reminded me of an abstract racetrack (the color wasn't quite right when I received it, but a can of high gloss spray paint was a quick fix); the strappy sandals (already in my closet) feature industrial looking black and white cords; the black crystal bracelet is evocative of a race tire; I carried a vintage silver compact from the 1920s that features a car similar in design to those in the painting; and, of course, I had to create another custom "milk purse" to complete the look, because #WinnersDrinkMilk! 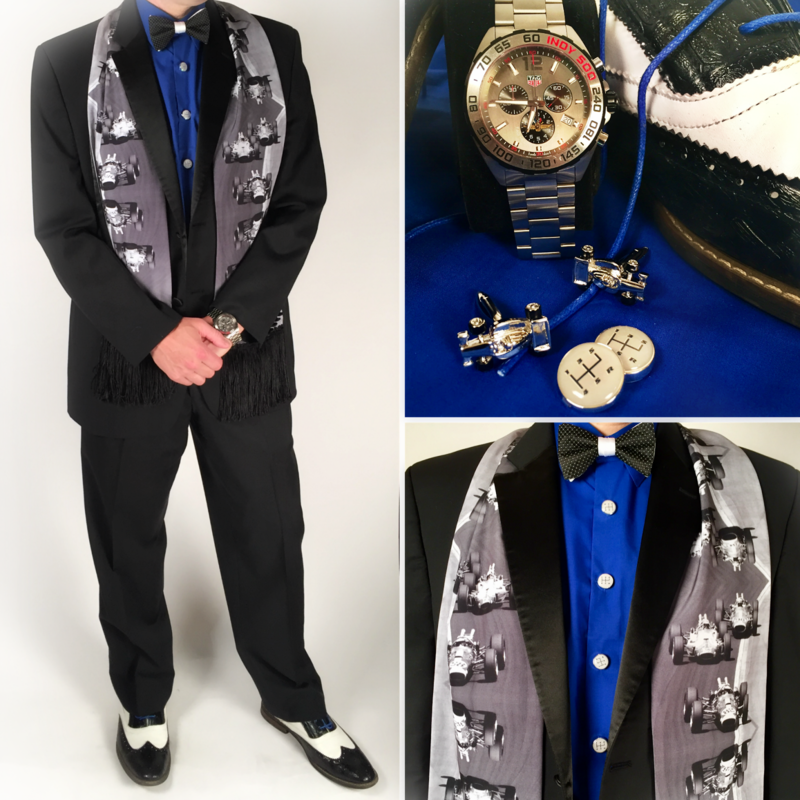 As the other "driver" on my team, KDef's "uniform" got the same attention to detail: cobalt blue shoelaces echo his tuxedo shirt and match my dress; his cufflinks were silver racecars; the button covers are gearshifts; his Tag Heuer watch is a limited edition Indy 500 piece created to celebrate last year's 100th running; and his scarf features a pattern I designed using a black and white photograph from the 1965 race. Oh yes, the art of the race, indeed! I'm linked up with Hat Attack! Just fabulous, love it all. 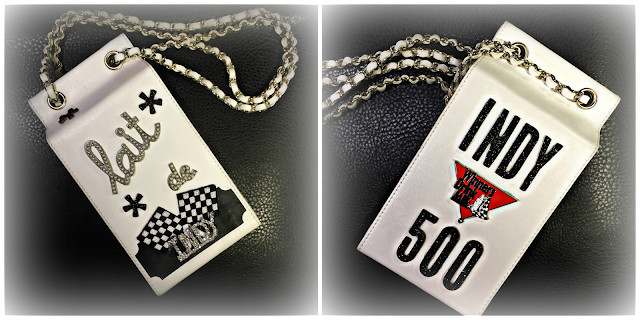 Your dress, in fact your entire ensemble, celebrates the history of the Indy 500 in marvelous style! Your pit crew is certainly talented, as always, you both look stunning. 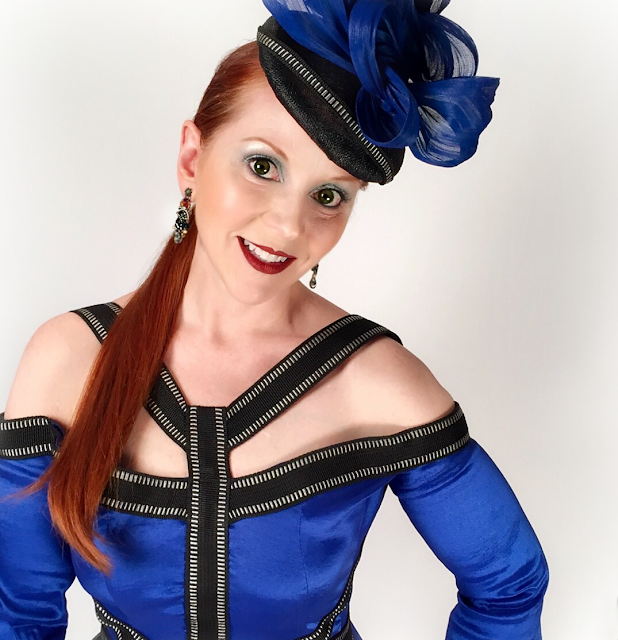 The tire tread feel of your hat combined with the blue bow is the perfect driver’s helmet for your one of a kind dress! Thank you for sharing with Hat Attack! Thank you, Judith! As always, I just love the opportunity to connect through Hat Attack!